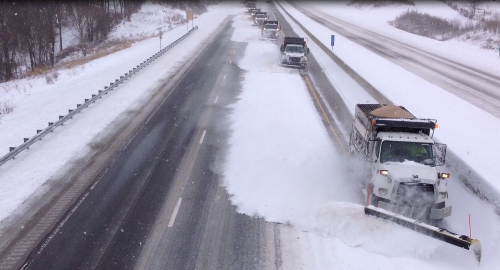 The Kentucky Transportation Cabinet provided an assessment of its snow fighting capabilities on Nov. 13 ahead of Winter Storm Avery, which affected portions of the eastern United States. The KYTC noted that it has 2,000 personnel, 1,400 plow trucks, 340,000 tons of salt, one million gallons of salt brine for anti-icing plus one million gallons of calcium chloride, an additive to salt for deicing, at the ready to keep the state’s more than 28,000 miles of road clear during winter weather events. During routine snow and ice occurrences, the agency said its crews operate using snow and ice priority route maps for maximum efficiency of equipment and materials usage. Additionally, KYTC said it has expanded the use of automatic vehicle location or AVL units to approximately half of state-owned trucks. This technology captures air and pavement temperatures, speed data, and salt or liquid distribution rates during response activities, the agency noted, and help informs decisions regarding how to efficiently apply materials. That data, captured electronically, also reduces the amount of manual recordkeeping of staff hours and materials used during events, the agency added. For severe winter storm events, the KYTC said it has established a snow emergency plan similar to state emergency plans for other major weather events, such as floods, hurricanes, and earthquake. That plan emergency plan will allow available resources within each county to be deployed as needed to ensure optimal mobility for the highest priority routes that lead to critical locations, such as medical facilities, the agency added.